Kevin C. Heslin, Ph.D., and Anne Elixhauser, Ph.D.
Access to medications for HIV disease has been supported by a number of health policies and programs. Since 1990, the Ryan White Program has served as a "payer of last resort" for people with HIV who are under- or uninsured, providing HIV medications to people with minimal or no prescription drug coverage through the AIDS Drug Assistance Programs in all 50 states.6 Historically, Medicaid has been the most common source of coverage for people with HIV, and the 2010 Patient Protection and Affordable Care Act called for expanding Medicaid to nearly all adults with incomes of up to 138 percent of the Federal Poverty Level. In June 2012, the U.S. Supreme Court ruled that States could decide whether to participate in the Patient Protection and Affordable Care Act Medicaid expansion. In States that have expanded Medicaid, previously uninsured people with HIV who were not eligible through the traditional income and disability criteria of the Social Security Income program have obtained coverage. A recent analysis using six Healthcare Cost and Utilization Project (HCUP) State Inpatient Databases found that the percentage of uninsured hospital stays among HIV patients fell from 13.7 percent to 5.5 percent between 2012 through 2014 in four Medicaid expansion States, while increasing from 14.5 percent to 15.7 percent in two comparison States that did not expand Medicaid. Hospital stays with a principal HIV diagnosis decreased by 49 percent between 2006 and 2013, from 72,486 to 36,970. The rate of stays per 100,000 population rose for patients aged 55 years and older, increasing by 27 percent among patients aged 55-64 years and by 57 percent among patients aged 65 years and older. For all other age groups, hospitalization rates decreased. Aggregate costs of stays involving HIV decreased by 12 percent between 2006 and 2013, from $3.20 billion to $2.83 billion. Between 2006 and 2013, substance-related disorders among hospitalized HIV patients decreased by 27 percent, from 72,527 to 52,705. Disorders of lipid metabolism became one of the 15 most common diagnoses among hospitalized HIV patients in 2013 (32,930 stays). These disorders were not among the top 15 diagnoses in 2006 or in 2010. The Patient Protection and Affordable Care Act will eliminate the gap in prescription drug coverage (the "donut hole") in Medicare Part D by 2020, which will reduce copayments on expensive medications for Medicare beneficiaries with HIV. For people who are not eligible for Medicaid or Medicare, the Patient Protection and Affordable Care Act has increased access to private insurance through the State health insurance exchanges that were introduced in late 2014. Insurance plans offered on the exchanges must cover an essential benefits package and cannot include lifetime or annual coverage caps or provisions that limit coverage for pre-existing conditions such as HIV disease. Because people with HIV disease are living longer, noninfectious complications and comorbid diseases have increased in frequency.12 Antiretroviral therapy for HIV also involves side effects and long-term toxicities, which may occur more frequently in older patients who have greater risks of pharmacological interactions with non-HIV medications. Antiretroviral therapy is associated with disorders of lipid metabolism.13 By accelerating atherosclerosis, HIV medications may also increase the risk of hypertension and stroke.14 These conditions contribute to disability and mortality among people with HIV disease, and their treatment often involves hospitalization. 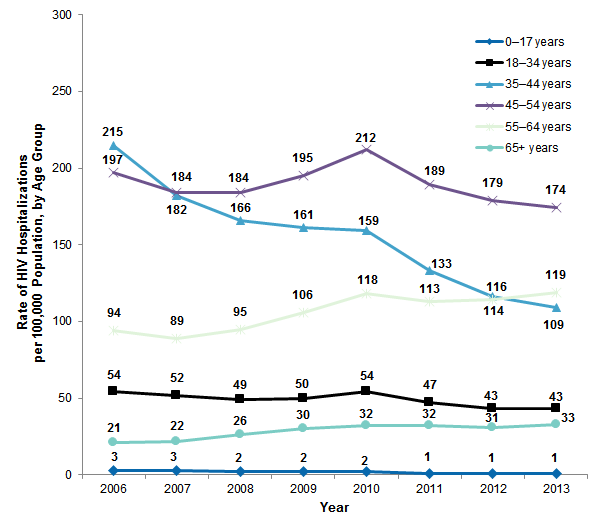 This HCUP Statistical Brief updates a previous Brief on hospital stays that included diagnoses of HIV disease from 1998 through 2005.15 The current Brief presents data from the National (Nationwide) Inpatient Sample from the 2006-2013 period to examine trends in hospital stays that include principal and secondary diagnoses of HIV, as well as age-specific trends in hospitalization rates per 100,000 population. Differences of 10 percent or greater are noted in the text. As in the previous Statistical Brief on HIV hospitalizations, we report on major HIV-related conditions that usually do not occur in people whose immune systems are not compromised. These conditions are cited in the 2014 HIV infection surveillance case definition by the Centers for Disease Control and Prevention.16 Finally, we provide information on the 15 most common diagnoses (principal and secondary) among stays that include any diagnosis of HIV disease for 2006, 2010, and 2013. Figure 1 presents the number of hospital stays that included a principal diagnosis of HIV disease, as well as the number of stays with a secondary HIV diagnosis, for each year between 2006 and 2013. Source: Agency for Healthcare Research and Quality (AHRQ), Center for Delivery, Organization, and Markets, Healthcare Cost and Utilization Project (HCUP), Nationwide Inpatient Sample (NIS) 2006-2011, National Inpatient Sample (NIS), 2012-2013. Figure 1 is a line graph that shows the number of hospital stays with a principal or secondary HIV diagnosis by year. For principal HIV diagnoses, the number of hospital stays was: 2006: 72,486; 2007: 66,176; 2008: 58,084; 2009: 51,427; 2010: 54,692; 2011: 44,661; 2012: 38,625; 2013: 36,970. The cumulative percentage change for 2006-2013 was -49%. For secondary HIV diagnoses, the number of hospital stays was: 2006: 182,559; 2007: 168,836; 2008: 172,555; 2009: 189,173; 2010: 203,246; 2011: 184,892; 2012: 177,935; 2013: 178,030. The cumulative percentage change for 2007-2010 was 20% and for 2010-2013 was -12%. Hospital stays involving a principal HIV diagnosis decreased steadily between 2006 and 2013, whereas stays with a secondary HIV diagnosis increased until 2010, and then decreased. Cumulatively, hospital stays with a principal HIV diagnosis decreased by 49 percent between 2006 and 2013 (from 72,486 to 36,970). Over the 2006-2013 period, the number of hospital stays with a secondary HIV diagnosis was more volatile than stays with a principal HIV diagnosis. Specifically, the number of stays with a secondary diagnosis cumulatively increased by 20 percent between 2007 and 2010. This peak of 203,246 stays in 2010 was followed by a 12 percent decrease to 178,030 stays in 2013. Figure 2 presents the rate of hospital stays that included any diagnosis of HIV disease (principal or secondary) per 100,000 population for six separate age groups, for each year between 2006 and 2013. Figure 2 is a line graph that shows the rate of HIV hospitalizations per 100,000 population by age group by year. 0-17 years: 2006: 3; 2007: 3; 2008: 2; 2009: 2; 2010: 2; 2011: 1; 2012: 1; 2013: 1. 18-34 years: 2006: 54; 2007: 52; 2008: 49; 2009: 50; 2010: 54; 2011: 47; 2012: 43; 2013: 43. 35-44 years: 2006: 215; 2007: 182; 2008: 166; 2009: 161; 2010: 159; 2011: 133; 2012: 116; 2013: 109. 45-54 years: 2006: 197; 2007: 184; 2008: 184; 2009: 195; 2010: 212; 2011: 189; 2012: 179; 2013: 174. 55-64 years: 2006: 94; 2007: 89; 2008: 95; 2009: 106; 2010: 118; 2011: 113; 2012: 114; 2013: 119. 65+ years: 2006: 21; 2007: 22; 2008: 26; 2009: 30; 2010: 32; 2011: 32; 2012: 31; 2013: 33. The rate of hospital stays that included an HIV diagnosis (principal or secondary) per 100,000 population decreased for all groups under age 55, but increased for patients aged 55 years and over. Patients aged 45 to 54 years had rates that peaked in 2010 at 212 per 100,000 population but then decreased by 18 percent to 174 per 100,000 population in 2013. 57 percent among patients aged 65 years and older (2006: 21 per 100,000 population; 2013: 33 per 100,000 population). For 2006, 2010, and 2013, Table 1 presents stays with a principal or secondary HIV diagnosis by patient characteristics and resource use, as well as the cumulative percentage change between 2006 and 2013.
a The list of HIV-related conditions is taken from Selik RM, Mokotoff ED, Branson B, Owen SM, Whitmore S, Hall HI. Revised Surveillance Case Definition for HIV Infection-United States, 2014. MMWR. 2014;63(3):1-10.
b This diagnosis is based on a â€œV codeâ€� that specifically indicates a personal history of recurrent pneumonia and may not necessarily indicate active pneumonia during the hospital stay. c Costs in 2006 and 2010 were adjusted for inflation to the 2013 level using Gross Domestic Product price indices for those years. Between 2006 and 2013, the number of hospital stays that included HIV diagnoses decreased, as did the number of in-hospital deaths among patients with HIV. In 2013, there were 215,000 hospital stays that included a principal or secondary diagnosis of HIV disease, compared with 255,035 in 2006 (16 percent decrease). There were 5,400 in-hospital deaths among HIV patients in 2013, compared with 8,357 deaths in 2006 (35 percent decrease). With the exception of Medicare, hospital stays involving HIV disease decreased for all payer groups. Comparing 2006 and 2013, the number of stays including HIV disease that were covered by Medicare was essentially stable. HIV-related clinical conditions decreased between 2006 and 2013, with the exception of a history of recurrent pneumonia and weight loss—both of which increased. Between 2006 and 2013, diagnoses of weight loss among patient stays with HIV increased by 97 percent and history of recurrent pneumonia increased by 153 percent. The two most common HIV-related complications in 2006—candidiasis and pneumocystosis— also were the most common complications in 2013. Candidiasis and pneumocystosis were the two most common HIV-related complications among HIV hospital stays. In 2006, 13.6 percent of stays involved candidiasis (34,586) and 5.3 percent of stays involved pneumocystosis (13,611). Although the number of stays including these diagnoses decreased by 2013, they continued to be the two most common HIV-related complications: 10.2 percent of HIV stays involved candidiasis (21,865), and 3.6 percent involved pneumocystosis (7,790). Between 2006 and 2013, mean length of stay and aggregate costs of HIV-related stays decreased. Table 2 presents the 15 most common all-listed diagnoses for hospital stays that included any diagnosis of HIV disease in 2006, 2010, and 2013. Note: Diagnoses were identified using AHRQ's Clinical Classifications Software (CCS). Hypertension was the second most common all-listed diagnosis among HIV-related hospital stays, after HIV disease, in 2006, 2020, and 2013. Hypertension diagnoses among hospitalized HIV patients increased by 23 percent between 2006 and 2013 (2006: 76,318 stays; 2013: 93,555 stays). Among non-HIV stays, hypertension also was the most common all-listed diagnosis in 2006, 2010, and 2013 (data not shown in table). Renal failure became more common among hospitalized HIV patients between 2006 and 2013, moving up in rank from 11th to 6th in the top 15 all-listed diagnoses. Between 2006 and 2013, the number of HIV stays that had an all-listed diagnosis of renal failure increased by 39 percent (2006: 42,949; 2013: 59,640). Among non-HIV stays, renal failure also increased in prevalence between 2006 and 2013 (data not shown in table). Substance-related disorders became less common among hospitalized HIV patients between 2006 and 2013, dropping in rank from third to ninth in the top 15 all-listed diagnoses. Between 2006 and 2013, the number of HIV stays that had an all-listed diagnosis of a substance-related disorder decreased by 27 percent (2006: 72,527; 2013: 52,705). For non-HIV stays, substance-related disorders did not appear among the top 15 all-listed diagnoses in 2006, 2010, or 2013 (data not shown in table). Disorders of lipid metabolism ranked as one of the top 15 all-listed diagnoses for hospitalized HIV patients in 2013, but not in 2006 or in 2010. The 13th most common all-listed diagnosis in 2013 was disorders of lipid metabolism, involving 32,930 hospital stays (15.3 percent). By contrast, the 15 most common diagnoses for 2006 and 2010 did not include disorders of lipid metabolism. For non-HIV stays, disorders of lipid metabolism ranked among the top 15 conditions in 2006, 2010, and 2013 (data not shown in table). Pneumonia diagnoses became less common among hospitalized HIV patients between 2006 and 2013, dropping in rank from 8th to 12th in the top 15 all-listed diagnoses. Between 2006 and 2013, the number of HIV stays that had an all-listed diagnosis of pneumonia decreased by 27 percent (2006: 50,326; 2013: 36,660). For non-HIV stays, pneumonia did not appear among the top 15 all-listed diagnoses in 2006, 2010, or 2013 (data not shown in table). Mycoses became less common among hospitalized HIV patients between 2006 and 2013, dropping in rank from 12th to 15th in the top 15 all-listed diagnoses. The number of HIV stays that had an all-listed diagnosis of mycoses decreased from 40,859 in 2006 to 25,175 in 2013—a decrease of 38 percent. For non-HIV stays, mycoses did not appear among the top 15 all-listed diagnoses in 2006, 2010, or 2013 (data not shown in table). The principal diagnosis is the condition established after study to be chiefly responsible for the patient's admission to the hospital. Secondary diagnoses are concomitant conditions that coexist at the time of admission or develop during the stay. All-listed diagnoses include the principal diagnosis plus these additional secondary conditions. CCS categorizes ICD-9-CM diagnosis codes into a manageable number of clinically meaningful categories.18 This clinical grouper makes it easier to quickly understand patterns of diagnoses. CCS categories identified as Other typically are not reported; these categories include miscellaneous, otherwise unclassifiable diagnoses that may be difficult to interpret as a group. In this report, a hospital stay was designated as including HIV disease if the relevant CCS code for HIV (i.e., CCS #5: ICD-9-CM codes: 042 0420 0421 0422 0429 0430 0431 0432 0433 0439 0440 0449 07953 27910 27919 79571 7958 V08) appeared as any all-listed diagnosis on the patient record. The ICD-9-CM diagnosis codes used to define HIV-related conditions are listed in Table 3. Total hospital charges were converted to costs using HCUP Cost-to-Charge Ratios based on hospital accounting reports from the Centers for Medicare & Medicaid Services (CMS).19 Costs reflect the actual expenses incurred in the production of hospital services, such as wages, supplies, and utility costs; charges represent the amount a hospital billed for the case. For each hospital, a hospital-wide cost-to-charge ratio is used. Hospital charges reflect the amount the hospital billed for the entire hospital stay and do not include professional (physician) fees. n 1 year will be counted each time as a separate discharge from the hospital. In this Statistical Brief, costs in 2006 and 2010 are adjusted for inflation to the 2013 level using the Gross Domestic Product (GDP) Price Index from the U.S. Department of Commerce, Bureau of Economic Analysis (BEA) for those years.20 That is, all costs are expressed in 2013 dollars. Mean cost per day is calculated as the cost per stay divided by the length of stay and is reported to the nearest hundred. Heslin KC (AHRQ), Elixhauser A (AHRQ). HIV Hospital Stays in the United States, 2006-2013. HCUP Statistical Brief #206. June 2016. Agency for Healthcare Research and Quality, Rockville, MD. http://www.hcup-us.ahrq.gov/reports/statbriefs/sb206-HIV-Hospital-Stays-Trends.pdf. 1 Centers for Disease Control and Prevention. Diagnoses of HIV Infection in the United States and Dependent Areas, 2014. HIV Surveillance Report, Vol. 26. November 2015. http://www.cdc.gov/hiv/pdf/library/reports/surveillance/cdc-hiv-surveillance-report-us.pdf. Accessed January 26, 2016. 2 Centers for Disease Control and Prevention. HIV in the United States: At a Glance. 2015. http://www.cdc.gov/hiv/statistics/overview/ataglance.html. Accessed January 25, 2016. 3 UNAIDS. 15 by 15: A Global Target Achieved. Geneva, Switzerland: UNAIDS; 2015. 4 World Health Organization (WHO). HIV/AIDS. Fact Sheet #360. Updated November 2015. http://www.who.int/mediacentre/factsheets/fs360/en/. Accessed January 25, 2016. 6 Kaiser Family Foundation. The Ryan White Program. Menlo Park, CA: Kaiser Family Foundation; March 2013. http://kff.org/hivaids/fact-sheet/the-ryan-white-program/ Accessed May 17, 2016. 7 Kates J. How the ACA changes pathways to insurance coverage for people with HIV. Menlo Park, CA: Kaiser Family Foundation; September 18, 2012. http://kff.org/hivaids/perspective/how-the-aca-changes-pathways-to-insurance-coverage-for-people-with-hiv/. Accessed January 25, 2016. 8 Hellinger FJ. In four ACA expansion States, the percentage of uninsured hospitalizations for people with HIV declined, 2012-2014. Health Affairs. 2015;34(12):2061-8. 9 Hall HI, Frazier EL, Rhodes P, Holtgrave DR, Furlow-Parmley C, Tang T, et al. Differences in human immunodeficiency virus care and treatment among subpopulations in the United States. Journal of the American Medical Association. 2013;173(14):1337-44. 10 Beers MH, Jones TV. Human Immunodeficiency Virus Infection. In: The Merck Manual of Geriatrics, 3rd ed. Whitehouse Station, NJ: Merck Research Laboratories; 2005:1378-82. 11 Sterling TR, Chaisson RE. General Clinical Manifestations of Human Immunodeficiency Virus Infection. In: Mandell, Douglas, and Bennett's Principles and Practice of Infectious Diseases, 6th ed. Philadelphia, PA: Elsevier Churchill Livingstone; 2004:1546-66. 12 Crum NF, Riffenburgh RH, Wegner S, Agan BK, Tasker SA, Spooner KM, et al. Comparisons of causes of death and mortality rates among HIV-infected persons: analysis of the pre-, early, and late HAART (highly active antiretroviral therapy) eras. Journal of the Acquired Immune Deficiency Syndromes. 2006;41:194-200. 13 Wohl DA. Considering metabolic issues when initiating HIV therapy. Current HIV/AIDS Reports. 2007;4(3):119-25. 14 Benjamin LA, Bryer A, Emsley HC, Khoo S, Solomon T, Connor MD. HIV infection and stroke: current perspectives and future directions. Lancet Neurology. 2012;11(10):878-90. 15 Zhao Y, Encinosa W, Hellinger F. HIV Hospitalizations in 1998 and 2005. HCUP Statistical Brief #41. November 2007. Agency for Healthcare Research and Quality, Rockville, MD. http://www.hcup-us.ahrq.gov/reports/statbriefs/sb41.pdf. 16 Selik RM, Mokotoff ED, Branson B, Owen SM, Whitmore S, Hall HI. Revised Surveillance Case Definition for HIV Infection-United States, 2014. MMWR. 2014;63(3):1-10. 17 Barrett M, Hickey K, Coffey R, Levit K. Population Denominator Data for Use with the HCUP Databases (Updated with 2014 Population Data). HCUP Methods Series Report #2015-07. September 1, 2015. U.S. Agency for Healthcare Research and Quality. hhttp://www.hcup-us.ahrq.gov/reports/methods/2015-07.pdf. Accessed February 17, 2016. 18 Agency for Healthcare Research and Quality. HCUP Clinical Classifications Software (CCS). Healthcare Cost and Utilization Project (HCUP). Rockville, MD: Agency for Healthcare Research and Quality. Updated June 2015. http://www.hcup-us.ahrq.gov/toolssoftware/ccs/ccs.jsp. Accessed February 17, 2016. 19 Agency for Healthcare Research and Quality. HCUP Cost-to-Charge Ratio (CCR) Files. Healthcare Cost and Utilization Project (HCUP). 2001-2012. Rockville, MD: Agency for Healthcare Research and Quality. Updated December 2014. http://www.hcup-us.ahrq.gov/db/state/costtocharge.jsp. Accessed February 17, 2016. 20 U.S. Bureau of Economic Analysis. National Income and Product Account Tables, Table 1.1.4 Price Indexes for Gross Domestic Product. http://www.bea.gov/iTable/iTable.cfm?ReqID=9&step=1#reqid=9&step=1&isuri=1. Accessed February 17, 2016. 21 For additional information about the NHEA, see Centers for Medicare & Medicaid Services (CMS). National Health Expenditure Data. CMS Web site May 2014. http://www.cms.gov/Research-Statistics-Data-and-Systems/Statistics-Trends-and-Reports/NationalHealthExpendData/index.html?redirect=/NationalHealthExpendData/. Accessed February 17, 2016. 22 American Hospital Association. TrendWatch Chartbook, 2014. Table 4.2. Distribution of Inpatient vs. Outpatient Revenues, 1992-2012. http://www.aha.org/research/reports/tw/chartbook/2014/table4-2.pdf. Accessed February 17, 2016. Internet Citation: Statistical Brief #206. Healthcare Cost and Utilization Project (HCUP). June 2016. Agency for Healthcare Research and Quality, Rockville, MD. www.hcup-us.ahrq.gov/reports/statbriefs/sb206-HIV-Hospital-Stays-Trends.jsp.